Cadillac, Michigan. 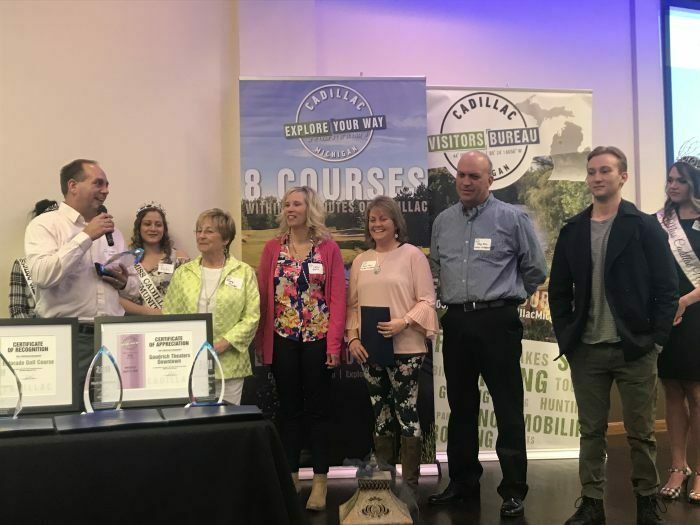 Over 100 area businesses and volunteers celebrated last night at the Cadillac Area Visitors Bureau (CAVB) Annual Meeting and Tourism Awards Banquet, held at Cherry Grove Event Center. The event presented area tourism impact and presented seven (7) awards, several milestone recognition plaques and words of thanks to the CAVB Board, Staff and office volunteers. The celebration kicked off with a Economics Tourism Report *stating that visitor spending in Wexford County had increased from $69M in 2011 to $124M in 2016, or an estimated $130M in 2017. What the presentation didn’t get into are the details of how this compares to the other counties in our region – see graphic. Comparatively the CAVB occupancy numbers, or hotel rooms sold per day during this same timeframe shows that in 2011 just over 65,000 hotel room nights where sold, to 93,000 hotel room nights in 2017. 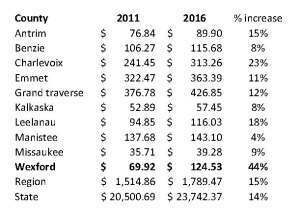 These numbers are only from the 14 Visitors Bureau district hotels in Cadillac. Showing a 42% increase during that same timeframe. This means that since 2011 the additional marketing efforts of the CAVB has helped Wexford county gain an addition $61 million* to its tourism based business annual cash flow. The rest of the evening was truly celebrating success stories of area businesses and people who love Cadillac. Recreation Excellence Award (Business/ Organization) Winner is Merritt Speedway. The award ceremony was supported by the Miss NASF Court, each award winner received a special crystal award and an official recognition certificate from Congressman Moolenaar’s Office, U.S. House of Representatives. Nominations for these awards are encouraged, with nomination forms available on cadillacmichigan.com after the first of the year annually. All residents in the greater Cadillac area are encouraged to nominate people and businesses they believe should be celebrated. We all have an ever growing need for volunteers to support festivals and events. Over the past few years the CAVB has developed a digital list of over 100 area residents that are willing to help. This new program will engage, inform and motivate volunteers. Around the tourism industry there are several programs at various costs, the CAVB will invest $10,000 in this first year to get it up and running. The Certified Explorer Program will enable the CAVB to help support group events, festivals and offer residents ample opportunities to engage at various levels. Our Certified Explorer Program will reach out to retirees, youth, parents, employers, young professionals and every facet of residents we have. The program will offer cool vests to identify them, they will have badges and participants will help build the program as it matures. The Certified Explorer program will need Trained Guides, of which we will be reaching out to engage an initial smaller number of residents, those that want to lead or have influence, to be the guiding force to further develop the program. Our Certified Explorers will know most everything about our area, they will be empowered with not only knowledge but experience –they will have online training as well as attraction experience opportunities. New website for www.cadillacmichigan.com Our digital presence on the ‘world wide web’ is 5 years old, which doesn’t seem old, but in the digital world it’s almost ancient. We host over 400 pages of information. This project will over‐haul all content, updating photos, adding video and integrating all of our digital platforms – the new website will deliver a web experience aimed at speaking to the visitor during their primary stages of vacation planning while giving them ample opportunity to share their experience with others. Area businesses will be asked to engage with the CAVB even more this summer, when the Summer Intern will be asking probing questions to help update all of the content. Efforts are underway currently to redesign, organize and deliver updated information later this summer to in an effort to capture more travelers attention and make them want to come to our little sandbox in NW Michigan.